Spring Preview Sale - 50% off Lenses. Shop New Prada Luxury Styles and Free Shipping. Lenses Included on $160+ orders. Free CR-39 lenses with every glasses purchase plus free shipping. Looking for a new pair of specs? Glasses.com carries over 80 of your favorite brands, including Oakley, Ray-Ban, Kate Spade, and Burberry. They also offer free prescription lenses and free shipping! Plus, you can take advantage of their team of expert stylists and opticians to help you find the perfect glasses. Don't forget to use a Glasses.com coupon code at checkout for easy-to-see savings! Save an additional $10 on select brands. These days, far from bringing shame for “nerdiness,” glasses have become a coveted fashion accessory. Of course, plenty of us need glasses for more than just looking cool. And when it comes to online glasses shopping, Glasses.com should be your first stop. Whether you’re looking for cat-eye glasses, chunky hipster frames, or a geek chic look, you’ll find the right frames at Glasses.com. They carry a variety of top brands for men and women including Ray-Ban, Burberry, Kate Spade, Ernest Hemingway, Oakley, and many others. If you’re not sure which type of frames will look best on your face, you can even shop by your face shape to find frame suggestions. If you wear glasses, this is a problem you’ll understand: squint in the bright sunlight, or wear sunglasses and squint because of the blurriness? Lucky for you, Glasses.com also offers a selection of prescription sunglasses, so you don’t have to make that difficult choice anymore. Shop their collection of fashion and sport sunglasses, and then order them with your prescription lenses. Glasses.com was launched in 2011 and is based in Salt Lake City, Utah. They process orders in-house using state-of-the-art technology so that they can offer a quick turnaround time on orders. The company’s vision is to bring customers exactly the style of glasses they want with the prescription lenses they need, all at affordable prices. Whether it’s time to change your frame style or your lens prescription, Glasses.com is the right place to find your next pair of glasses. You’ll be able to see the savings you get with a Glasses.com coupon code even without your glasses. Did you sit on your glasses again? Or do you just want to upgrade your look with some trendy new frames? Either way, you’ll find the glasses to fit your style at Glasses.com. Need help ordering or using a Glasses.com promo code? Read on for the answers to some common Glasses.com questions. Why isn’t this Glasses.com coupon working? It has probably already expired. Check to see if there’s an expiration date on the coupon – if that date has already passed, then the coupon will no longer work. If the coupon says “Limited time,” and isn’t working, then is has probably expired. It’s also possible there are restrictions on the coupon, like a minimum purchase amount. If your order doesn’t match the restrictions, then the coupon won’t work. Where do I check the coupon restrictions? On the Glasses.com page at CouponPal.com, look for a small “i” or “information” icon in the corner of the coupon. Click on it to reveal the restrictions. What information do I need to have ready when I order my glasses? You should have your billing and shipping addresses, payment information, and glasses prescription handy when you order your glasses at Glasses.com. What if I don’t have my prescription handy – can I still order? Yes. If you don’t have your prescription or you lost it, then you can provide your eye doctor’s name and contact information instead. Glasses.com will then contact your doctor to get your prescription information. 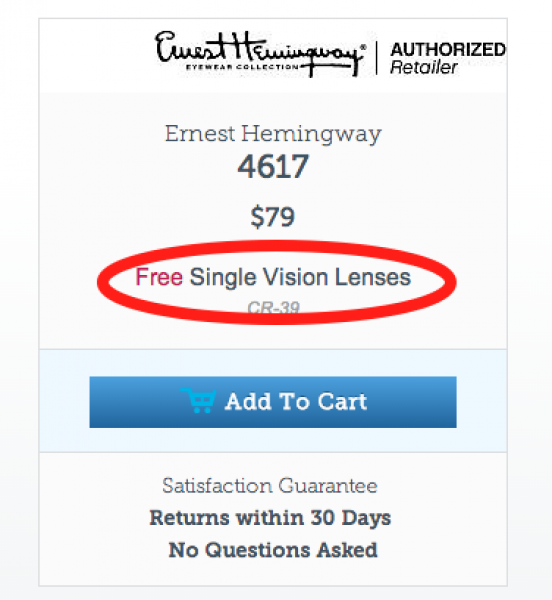 Does Glasses.com offer free shipping? Yes! Glasses.com offers free standard (5-7 day) shipping on all orders in the United States. If you need expedited shipping, it costs $12.95 for US orders. No, currently Glasses.com only ships to the United States. What is Glasses.com’s return policy? Glasses.com accepts returns within 30 days of your receipt of your order. If you’re unhappy with your order, you should contact Glasses.com customer service to get started with the returns process. How can I contact Glasses.com customer service? 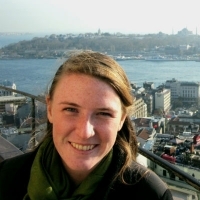 You can email them at info@glasses.com, or you can call them at 1-800-GLASSES (1-800-452-7737). First, decide which coupon for Glasses.com that you want to use and click "Get Deal" or "Get Code." A window will pop up showing you the Glasses.com coupon code. If it says "No Code Required," that means that your discount will be automatically applied when you shop. 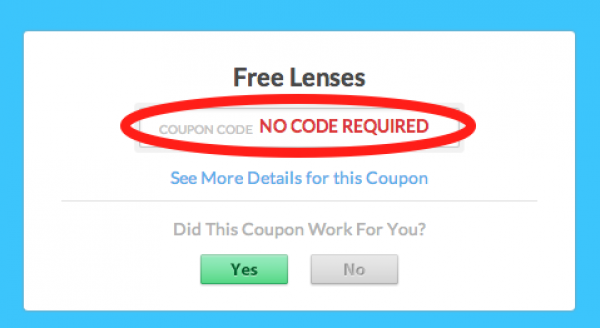 Most Glasses.com coupons don't require a code. Meanwhile, you'll be redirected to Glasses.com. Next, shop for your frames at glasses.com. You can shop men's and women's collections, or you can shop by style or even face shape, to find a pair that is flattering for you. When you find the frames you want, choose your prescription type and lens options and then click "Add to Cart." If you used a coupon that didn't require a code, you should see your discount now. If you chose a Glasses.com promo that requires a code, now is the time to use it. 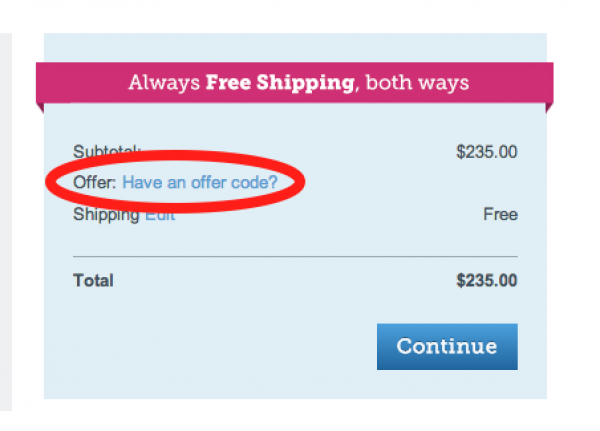 On your shopping cart page, look for the link toward the bottom of the page that says "Have an offer code?" Enter your Glasses.com promo code here and click "Submit." Then click "Continue" to go on to checkout. Now enter your shipping and billing addresses and then indicate how you will provide your prescription. Finally, enter your payment details and submit your order.